DEPUTY NATIONAL SECURITY adviser Mira Ricardel has left her post after a high-profile row with US first lady Melania Trump who called for her dismissal earlier this week, White House spokeswoman Sarah Sanders has announced. A replacement for Ricardel has yet to be named. White House aides have said that Ricardel clashed with the first lady’s staff over her visit to Africa last month yet it is highly unusual for a first lady or her office to weigh in on personnel matters, especially the president’s national security staff. White House press secretary Sarah Huckabee Sanders has confirmed that Ricardel will have a new role in the administration. 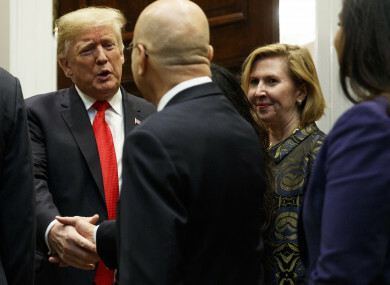 President Donald Trump’s White House has set records for administration turnover, with Ricardel the third person to hold the post under Trump. An ally of National Security Adviser John Bolton, Ricardel began her service in the Trump administration as associate director in the White House Office of Presidential Personnel but then moved to the Commerce Department last year. Bolton then brought her into the West Wing shortly after taking his job up in April. He is travelling in Asia this week alongside Vice President Mike Pence. Email “Trump security adviser leaves role after unprecedented public rebuke from first lady”. Feedback on “Trump security adviser leaves role after unprecedented public rebuke from first lady”.